Clipboard pages are nodes that are part of the clipboard. They act as buffers or temporary copies of object instances (of that class) that are copied from, or might later be stored in, the PegaRULES database or another database. The decisioning functionality of the Pega 7 Platform uses a separate implementation of clipboard pages to run strategies and data flows. 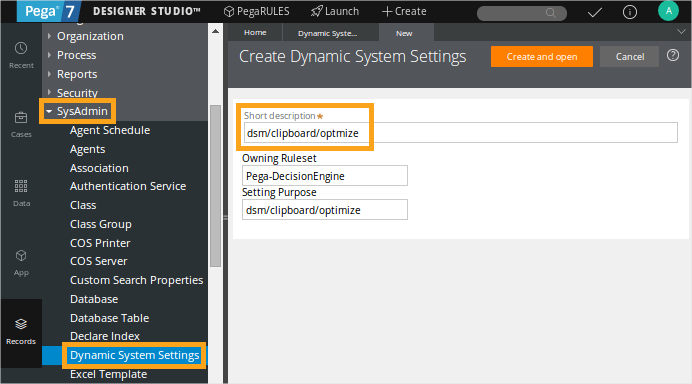 This default DSM clipboard pages implementation allows you to run strategies and data flows faster, but it does not support all the use cases of the Pega 7 Platform clipboard pages. To select the clipboard pages implementation that you need, create the dsm/clipboard/optimize Dynamic System Setting and set its value. When this setting is not specified or its value is set to true, strategies and data flows work on DSM clipboard pages. When you set the value to false, strategies and data flows work on the conventional Pega 7 Platform clipboard pages. This global switch for selecting which clipboard page implementation to use eliminates compatibility issues with earlier versions of the product and allows you to run strategies in a consistent way and get consistent results.